I don’t know if it’s because the angle is something you don’t regularly see or if it’s because they’re as close a realistic park map as you can get, but aerial photos of Walt Disney World have always made extremely happy. 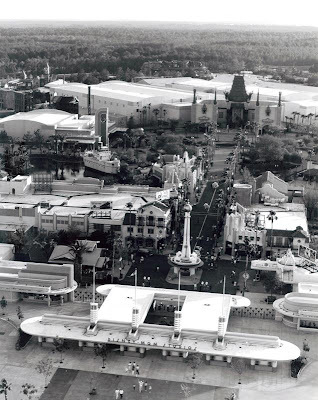 And when such aerial views are from a step back in time, such as today’s image of a 1989 Disney-MGM Studios, that only makes the photograph that much more enjoyable. All the classic signs are there: Crossroads of the World, Min and Bill’s Dockside Diner, New York Street, Superstar Television, Catastrophe Canyon off in the distance and, of course, the Chinese Theater which houses The Great Movie Ride. Of course, which all good photographs that tell a particular story, it is what isn’t present, or what has changed, that can be the most dramatic. The Sorcerer’s Hat is obviously missing, no need to rehash that discussion, so let’s carry on. Commissary Lane does not exist in this early version of the Studios, but there are a few rooftops from Residential Street poking up through the canopy in the background. The Tip Board and Dining Reservation booth, the Pacific Electric station at the corner of Hollywood and Sunset is also missing. Of course, this is because Sunset Boulevard hasn’t been created yet. In fact, just out of frame, and where Sunset Boulevard can be found today, is the original home of the Theatre of the Stars. There were more changes from these opening days throughout the park, Mickey Avenue would open as would the area around Star Tours and MuppetVision 3D, just to name a few, but they are sadly out of frame for this picture. Still, changing our perspective on a park gives us valuable insight into layout and design intent. 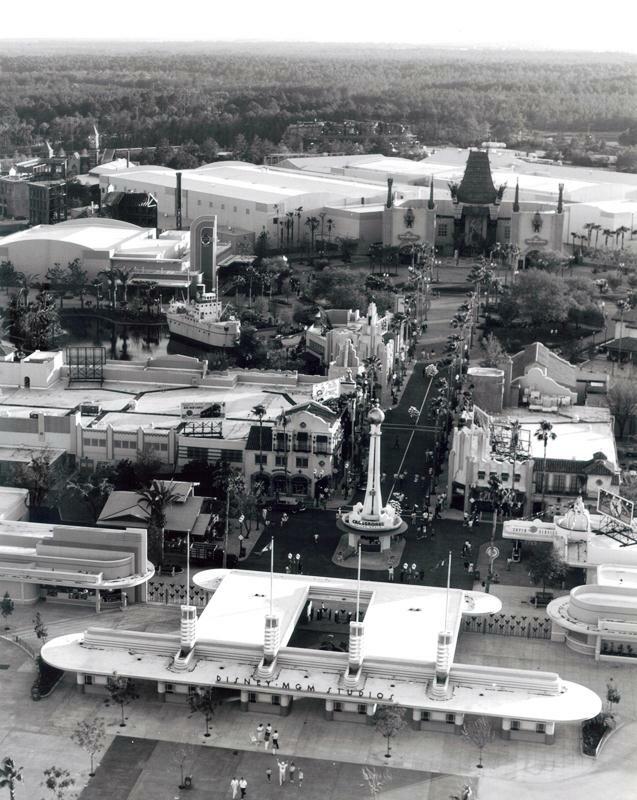 Not to mention it’s just plain cool to get a bird’s eye view of Disney-MGM Studios from the spring of 1989.